KATHMANDU, Jan 10: Even as the three major political parties have refrained from making formal comments on the arrest of Dr Govinda KC, several individual leaders from across party lines have come forward in support of the orthopedic surgeon, who is facing a contempt of court case. Former prime minister and Naya Shakti Party Nepal coordinator Baburam Bhattarai and Nepali Congress leader Gagan Thapa were among hundreds of people who hit the streets of the capital on Tuesday to protest KC’s arrest. Many other leaders have taken to social media to denounce the arrest and demanded immediate release of the anti-corruption crusader. 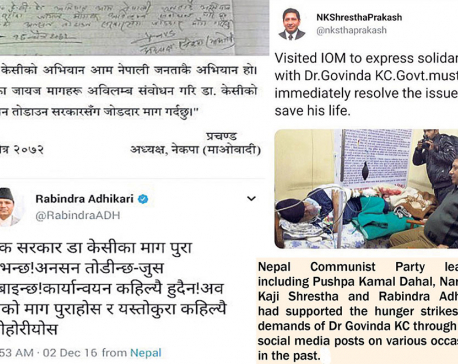 KC was arrested on Monday, hours after he started his 14th hunger strike, demanding resignation of Chief Justice Gopal Prasad Parajuli. Except Bibeksheel Sajha Party and Naya Shakti, no other political party has made its position clear on Monday’s arrest. 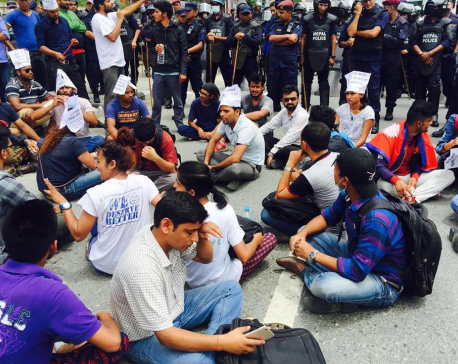 Most of those protesting against KC’s arrest were supporters of Bibeksheel Sajha Party. CPN-UML Secretary Pradeep Gyawali termed the apex court move against KC as biased and driven by an intention of revenge. “The court move is more than judicial activism. We can debate the issue of his demand but the way the court has moved to take revenge against a citizen is wrong,” said Gyawali. Gyawali also criticized Prime Minister Sher Bahadur Deuba for his statement that KC was arrested without notifying him. “It is ridiculous for the prime minister, who also heads the home ministry, to say that KC was arrested without his knowledge,” he added. Nepali Congress (NC) Spokesperson Bishwa Prakash Sharma expressed hope that the court would take a wise decision over the issue. “The court should work in a wise manner instead of being driven by temperament. I hope this case will be settled through a wise decision by the court and I think KC is committed about maintaining respect for the judiciary,” he said. NC leader Dhan Raj Gurung has also raised a question about the abrupt action of the court in arresting KC. CPN (Maoist Center) Spokesperson Pampha Bhusal said that though her party hasn’t discussed the issue, she is personally against the court’s move. “The issue that Dr KC has been raising could be debatable but the court’s move undermines people’s right to freedom of expression. The court should also clarify about the issue he has raised,” Bhusal said. Maoist senior leader Narayan Kaji Shrestha has tweeted that the court’s move targeting crusader KC was wrong.